Meet the Eurocircuits Team at Electronica 2018 in Munich! The largest electronics show in the World Electronica 2018 will soon be upon us running from 13-16 November at the Messa, Munich. Eurocircuits will be exhibiting our exciting new developments to our Online Visualisation tools, why not visit us in Hall C3 @ Stand 400 and find out more about our Unique PCB and Assembly Visualisation Tools. We will be performing LIVE demonstrations showing how this helps you to create “Right First Time for Assembly” layouts with immediate online pricing. Below, is a short video showing how the Eurocircuits eC Smart Tools help Design Engineers achieve “Right First Time for Manufacture” PCB’s. Visit us in Hall C3 @ Stand 400, meet the Eurocircuits Team and you will receive a free €50 discount voucher against your next Eurocircuits order when you register you email address with us. Should you have any questions about any of our services, please feel free to get in touch via email, telephone or instantly with our online chat during office hours. We will be more than happy to help. Why not follow us on our social media, keeping up to date with all of our latest news? Eurocircuits company update. This section contains updates and information about the Eurocircuits Group. As a valued partner you will receive updates and news covering our company activities, team news and business developments etc. Tips & Tricks.The electronic value chain starts with a design and then converting it to a digital form. This section covers all design related issues, their influence on manufacturing. Online Smart Tools – Services & Products. All Eurocircuits customers have access to an online customer account and through this, access to our Smart Tools and services. This section covers User Guides, updates and new features and tools etc. It will help you to optimise your knowledge, use of these tools and the electronic manufacturing services and products we offer. Customer Applications & Student Projects. Eurocircuits actively encourages its customers to share their experiences with other customers. In addition to this, we support many student projects and inspire them to write about their adventures and the technology they have designed. eCvelo. Next to being an Electronics Manufacturing Company, Eurocircuits also has a heart for clean mobility. As result we have developed and are building trike and quad cycles with a covered frame. Keep updated by opting in to this section. Eurocircuits TV is Eurocircuits’ media channel bringing electronic designers and others video news and VLOGs about our electronic manufacturing world. https://www.eurocircuits.com/wp-content/uploads/blog/meet-the-eurocircuits-team-at-electronica-2018-in-munich/311018.jpg 320 720 Super Admin http://www.eurocircuits.com/wp-content/uploads/2016/07/eurocircuits.png Super Admin2018-10-31 14:13:002018-10-31 14:13:31Meet the Eurocircuits Team at Electronica 2018 in Munich! A Exposição Internacional de Soluções para a Indústria Elétrica e Eletrónica MATELEC Internacional acontece de 13 a 16 de novembro de 2018. A Eurocircuits exibirá as nossas novas ferramentas de visualização on-line, visite nosso stand 5B17 no Hall 5 e obtenha mais informações sobre nossas ferramentas exclusivas de visualização de montagem e nosso novo serviço de montagem em 5 dias. Realizaremos demonstrações ao vivo de nossas ferramentas on-line do PCBA Visualizer, que mostrarão como criar designs com preços on-line imediatos. Abaixo pode visualizar um pequeno vídeo mostrando como as ferramentas on-line da Eurocircuits ajudam os engenheiros a criar e pedir PCBs pela primeira vez. As a new academic year starts the results and successes of the previous year student projects are published with some amazing results. All the student projects the Eurocircuits support are without doubt a path to the future, whether it be by reducing C02 emissions or harnessing the power of the sun or helping people walk again unaided, they all lead to a better future for all. This summer (2018), Eurocircuits TV surprised the student teams at the TU Delft Dream Hall with a visit. We met some of the teams and were able to capture some interesting interviews, take look at the video below. Dutch spoken – English and German subtitles can be activated. 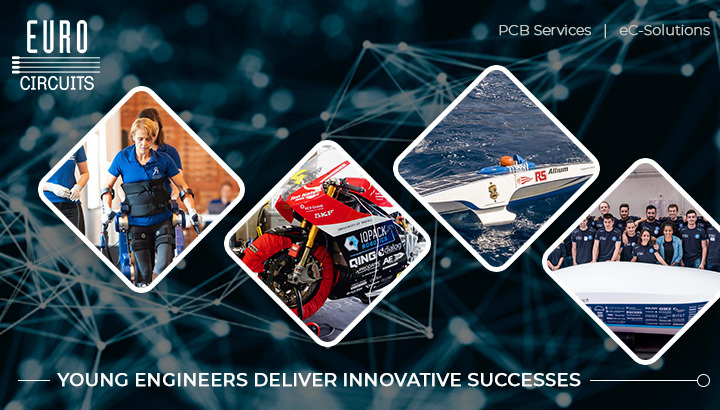 Please take a few minutes to see what other young student engineers have achieved, it’s very impressive, just click here. For more information about the Eurocircuits program to support Educational Students Projects, please click here. It has been over a year since we launched our Prototype & Small series Assembly service. One question that we are often asked is, what information must you our customer supply for the Assemble service. To answer this question, we need the BOM (Bill of Materials) and CPL (Component Placement List) data. These files are usually generated by the CAD system and output in an ASCII format, the format varies from one CAD system to another however, it is the information contained within these files that is important. MPN (Manufacturers Part Number) or Supplier Part Number. Component Reference Designations that use this Part. Below is an example of a BOM file. It is important that each line that contains a Component Reference Designator also contains the required part information. Using the CPL we automatically superimpose the components listed in the BOM to the PCB, allowing the verify the component placement on the PCB. Component Reference Designator (e.g. C1, L2, R3 etc). X and Y Position of the component Center. Great news for KiCAD and Eagle users as this information is already contained within the .BRD or .KiCAD file. Below is an example of a CPL file. For more information concern BOM and CPL files please visit the Eurocircuits PCBA Visualizer – user guide and the Eurocircuits Guide on How to Upload or Import BOM & CPL files into the PCBA Visualizer.